My thoughts on design thinking. Amid reports of its impending demise, and simultaneous rapid adoption throughout corporate America. Design Thinking continues to evolve as popular suite of methodologies for improving the quality of many different types of things. Products, experiences, communications, and even corporate structures can all be improved with this method. Major B-Schools throughout the country, From Stanford to Darden enthusiastically promote the discipline, and forward thinking Corporations are on board. All along, of course, it’s how we visual and experience designers have always worked. We are given a challenge, we get our heads around the problem, and the environment in which it exists, we come to understand how the user’s needs intersect with the business goals and come up with creative responses, which we then challenge and refine in order to come up with a robust, tested, and validated solution. But we didn’t invent the process. Science did. The Scientific Method is defined as systematic observation, measurement, and experiment, and the formulation, testing, and modification of hypotheses. And that is what UX designers seek to do. It is a repeatable process that we try to rigorously adhere to, so that we can get repeatable results. I recently attended the second annual Design Thinking for Financial Services conference here in NYC by Marcus Evans. I attended the first one, as well. It is not your usual conference. Instead it was simply 75 or so practitioners acting as (as Karen Pascoe of MasterCard said) a support group. Design Thinking is hard work, and getting your company on board is hard work. But the consensus at the conference was that it was worth it. It’s worth it because it is more efficient. Design to prototype to validation, however many cycles it takes, is still more cost effective than Launch and Fail—full stop, as they say—and so it is a fight worth fighting. 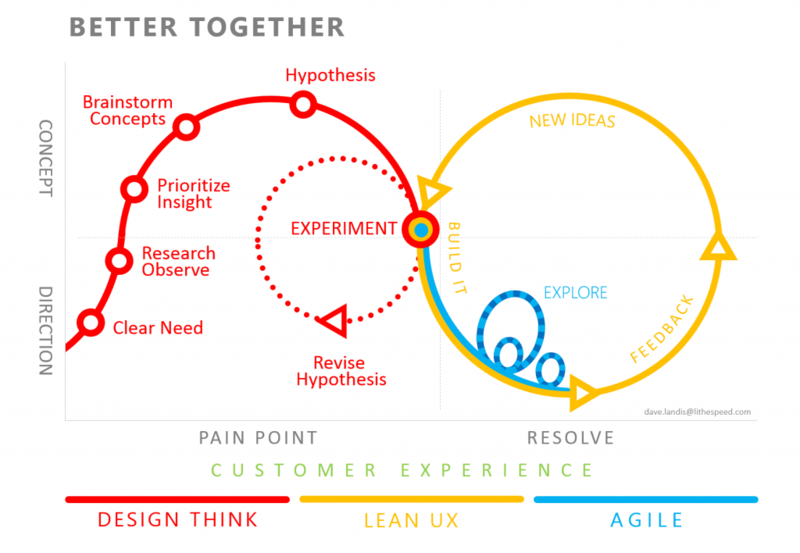 Of note: At this latest conference, several presenters (more than two) showed a version of this visual, which shows a path between design thinking as a define phase coupled with lean UX and agile as a build phase. 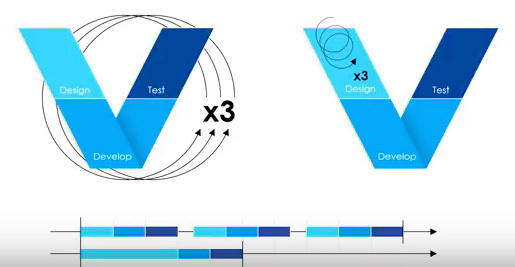 I was watching a presentation recently and the speaker put up a far simpler diagram showing the benefits of the design first methodology. It was so good I couldn’t help myself, and took a quick screenshot (I hope they don’t mind! Simple, right? Spend more quality time taking design seriously rather than jumping to conclusions to get something out there, and your overall effort to achieve a Minimum Lovable Product is lower. And the best thing about validated science, is that it demonstrates the validation with data. Are there other factors at play with these companies? Sure. They are beloved and universally recognized brands. If you want to dig deeper into why these “DVI” (Design Value Index) companies are being looked at as deriving value from design, here is the source article from the Design Management Institute, The Value of Design. Lastly, for now, the slideshare below shows the impact design forward thinking is having across the business landscape.